Oasis can handle your commercial gutter cleaning for any business. We have the tools, staff and knowledge to have your job done easily. Cleaning any commercial gutters can be a dangerous job and back breaking work. Your time is worth a lot. Isn’t it worth it to call Oasis and have us handle the hard work? We admit, cleaning gutters is not easy. In fact this is why many of our customers call us. No one wants to break their back, especially with gutter. Leave the hard dangerous jobs to Oasis. We are highly trained professionals, who accept this task so you don’t have to. One thing you don’t have time for is gutter maintenance. We can inspect your gutters and recommend a plan to get your gutters back in shape again. We will carefully perform a compete gutter inspection. This save’s you time, aggravation and money. Not to mention the fact that you don’t have to get up on a high ladder to perform this yourself. Leave this work to the pros. 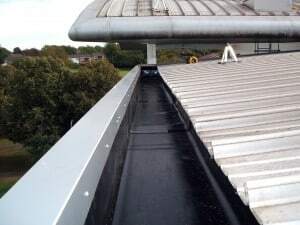 Sometimes we will find areas of your commercial gutters that need repaired. Usually we can take care of small repairs ourselves. However, if there is a need for a larger gutter repair, we work with several companies who will gladly help you repair your gutters. Either way, we’ll point you in the right direction. One thing about Oasis is, we are a highly professional company. We arrive when we say we will and get the job done when we say also. Out team prides themselves on looking professional and wearing our standard pro Oasis uniform. You will always have a pro at your business, who will help in anyway they can. Commercial gutter cleaning is not an easy job by any means. But Oasis gutter services can handle any job you throw our way. We are that confident in our ability to service your commercial business. And best of all our services will save you time and money. Keeping your commercial gutters cleaned every single year saves thousands of dollars because you are keeping on top of your gutters and spotting and potential problems which may just be a small fix. Check out this i Robot gutter cleaner.